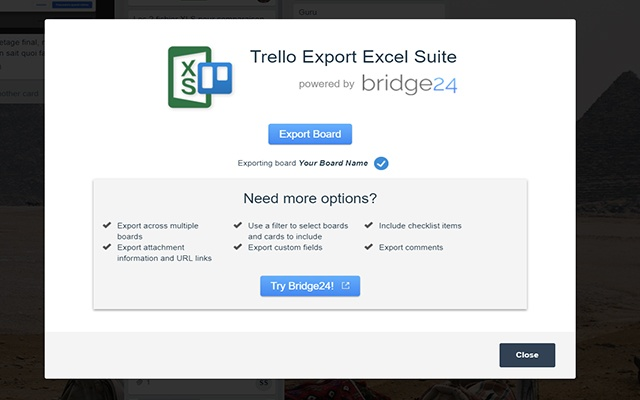 Bridge24, a powerful reporting and exporting application that integrates with Trello, Asana, Basecamp, and AceProject, has launched Trello Export Excel Suite. It is a free Chrome extension that easily exports card data of a Trello board in Excel format. It is now very easy for Trello users to have their card details and other project data viewable in Excel. There are situations when they need to share their tasks, status, progress, and other project information to stakeholders and partners who are not in Trello, or who prefer data in spreadsheet. Now it takes one click to accomplish this task. 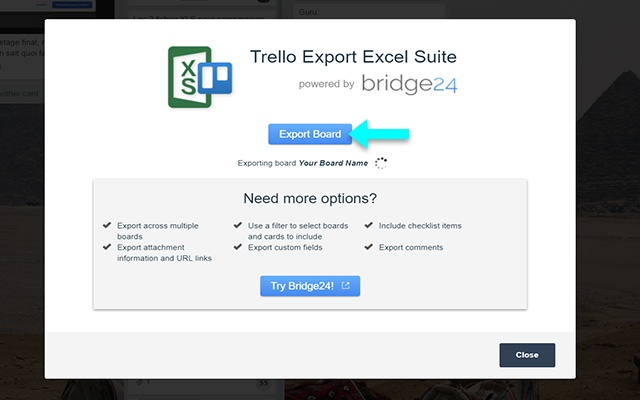 Trello Export Excel Suite runs on the same powerful exporting engine used by Bridge24. The same program that exports project data from Asana, Basecamp, and AceProject works under the hood of this Chrome extension. Thus, users can be confident that their data will transfer to an Excel file in a complete, accurate, and organized manner. 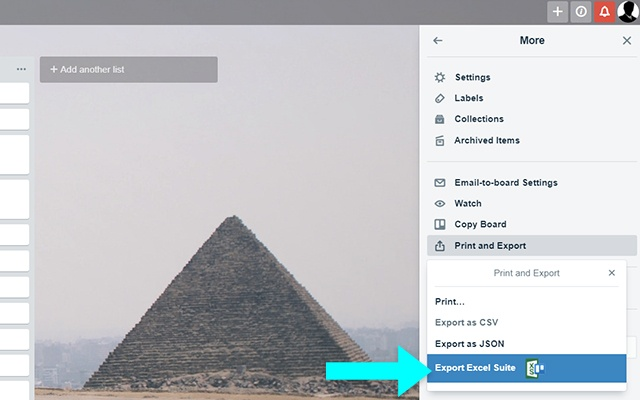 Exporting Trello data into Excel is instant with a click of button. The transfer of all important columns to an xlsx file is immediate. Users are able to export Card ID, Number, Card Name, Board, Description, List, Labels, Members, Due Date, Completed, Created Date, Last Updated At, and Card URL fields. After the export, users will be able to see all these columns and its content in their Excel spreadsheet. Available for free on the Chrome webstore, it takes only seconds to install the less than 1MB extension in the browser. After refreshing the browser, the additional exporting option will now display in Trello. Users simply have to go to Menu, select Print and Export, then choose the Export Excel Suite option. 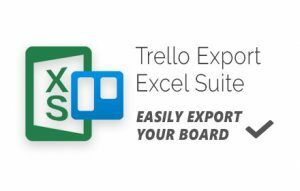 Trello Export Excel Suite is extremely useful for Trello users who need a simple and easy way to export their project data in Excel format. As a Chrome extension, they will just be using the same browser they are opening Trello with. Users have similarly great experiences in using the main program it came from, Bridge24. For some like Rinat N., they prefer the connector and view of Bridge24 over Trello. Some users like Carlos J. now prefer to work in Bridge24 than in their PM application. Ease of use is what they are looking for. And some like Richard C., tried many other exporting Power-Ups. But they finally settle with Bridge24, which they consider as the best product for exporting filtered data into Excel. It even supports custom fields, while others do not. No single platform provides all the solutions to the demands of modern work and the challenges of project management. Instead, integration plays an important role. Integrating innovative applications has become the better strategy in coming up with more efficient solutions. 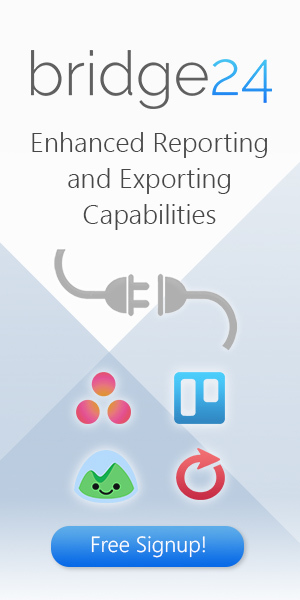 Trello Export Excel Suite is a simple, effective, and highly accessible exporting application. For greater flexibility and control, however, we recommend the complete version of Bridge24. If you are looking for a great reporting and exporting tool for Trello, we suggest trying out our own tool Bridge24 for Trello. For more information about reporting and exporting features of Bridge24, and other product announcements, follow Bridge24 on Facebook, Twitter, YouTube, or Google+.